My partner always teases me about the cleanliness of my car. She never fails to point out how beautiful my car looked when I picked her up for our first date – and the contrast to what it looks like now! I need to be honest with y’all: I am a pretty messy person. 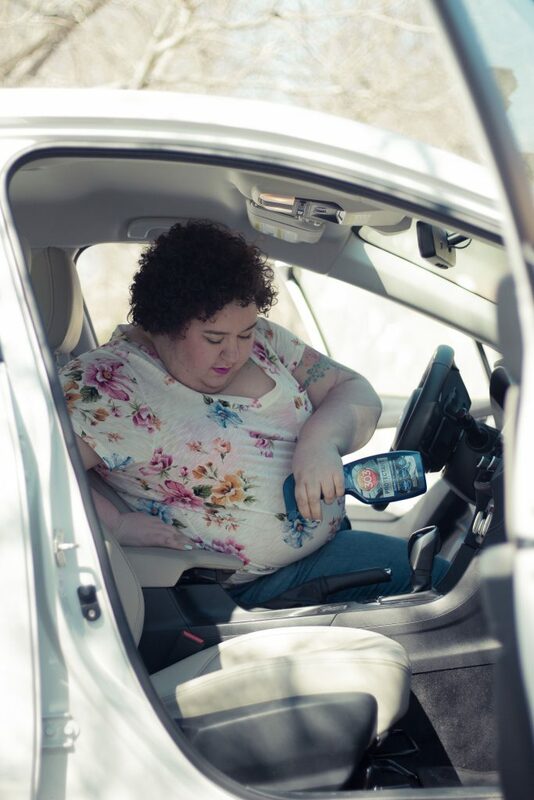 Before I picked her up for that first date, I spent a good $90 getting my car detailed. I wanted it to be spotless for a promising first date with a beautiful girl. Fast forward to now, and I’m trying to keep my car clean and welcoming. My car is babied when it comes to maintenance, but I struggle to keep it clean day-to-day. Getting a car detailed is expensive! But I never had the right tools to get the job done, either. 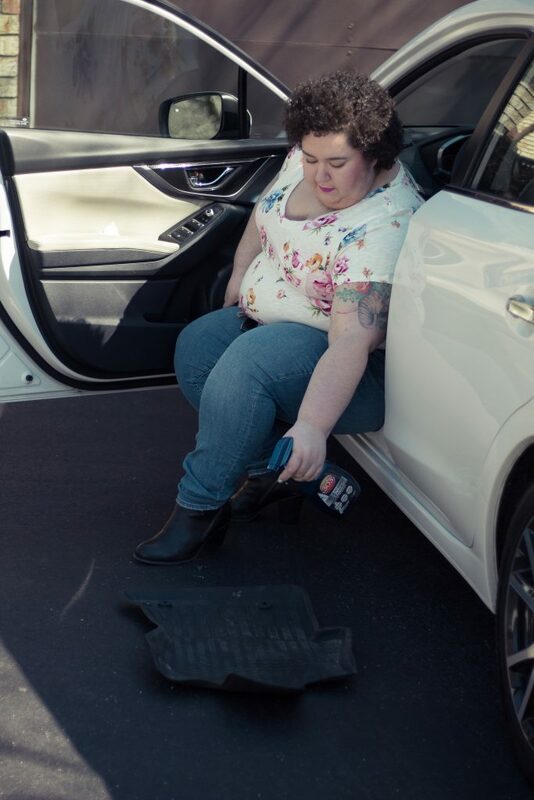 When 303 reached out to me about their automotive detailing products, I jumped on the chance to try out some amazing product – and TRY to keep my car looking sharp at all times! All opinions in this sponsored article are completely my own. Spring is finally here and my car has loads of salt and dirt residue everywhere (for you babes in warmer regions – salt is put on roads to keep them from icing up here in the Midwest). It’s time for spring cleaning, and fingers crossed, I hope to be able to maintain this clean as long as possible! I’m going to talk about two of my favorite products for the interior of the vehicle: Tire & Rubber Cleaner and 303 Automotive Protectant. First things first: my floor mats seem to always be disgusting. Dirty, muddy, and covered in salt. Clean mats make a huge difference in how clean a car looks and smells, but they can be tough to thoroughly clean. 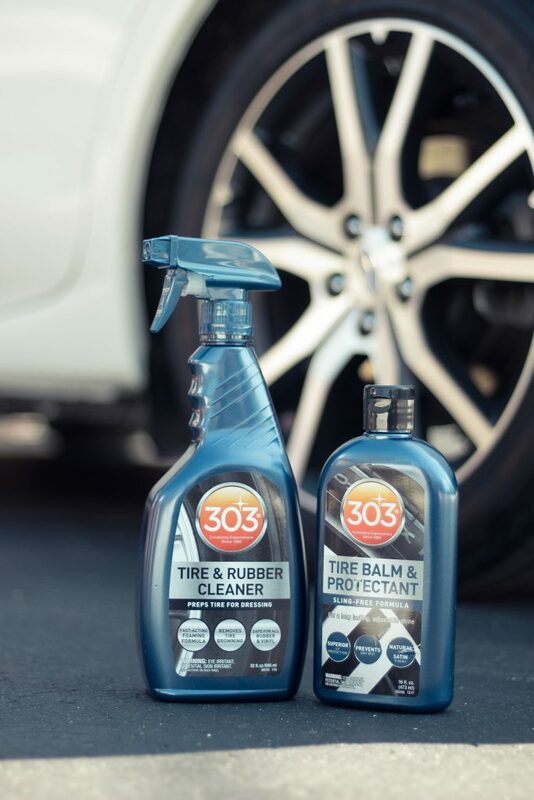 303 Tire & Rubber Cleaner is a versatile product – not only is this easy to clean my floor mats with, it’s also a fabulous product to prepare my tires for the 303 Tire Balm. Think of the Tire & Rubber Cleaner like a lip scrub and primer in one: it gets all the grime off my tires and makes a good base for lippie or, in this case, 303 Tire Balm. The Tire & Rubber Cleaner is a color-changing foam: as it cleans you can see the grime, dirt and salt disappear, and then your stunningly clean car reappears. I saw this in action on the inside of my car doors where there is salt residue from my shoes. It’s also perfect for cup holders and inside door handles. I’m really a sucker for products that are quick, super straightforward, and easy to use – so this ticks a lot of boxes for me! 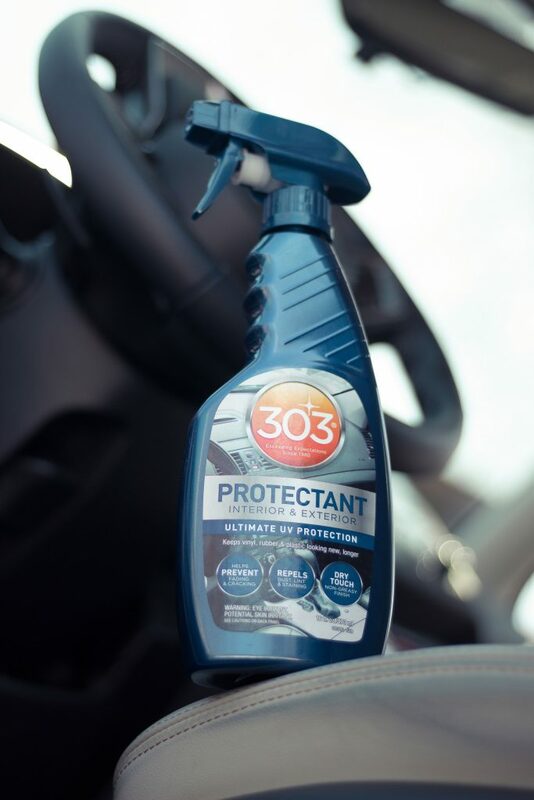 Once all my surfaces are clean, I spray them with 303 Automotive Protectant. This product provides UV protection from cracking and fading, as well as repels dust for a longer clean. A lot of protective products look shiny and greasy, but this one doesn’t do that! As with the Tire and Rubber cleaner, I am thrilled that the Protectant can be used on rubber, vinyl, treated leather, and plastic. Don’t forget your dashboard! They collect a lot of dust and are exposed to a lot of sun, plus they’re a focal point for passengers in the car. Don’t neglect it! After using these products, I’m thinking that keeping my car clean might not be as hard as I thought. All the products make it super simple and really add the “freshly detailed” feel to getting into the car. Come summer time I might have to get myself a bottle of 303 Ultra-Concentrated Cash Wash and get to washing the outside! Don’t forget to subscribe to Mechanic Shop Femme. I’ll be sharing a lot more products and how to use them next month. As a bonus, I’ll be doing an awesome giveaway of 303 detailing products on my Instagram as well. Follow there so you see it!